Four years ago, I hand embroidered all my Christmas cards. 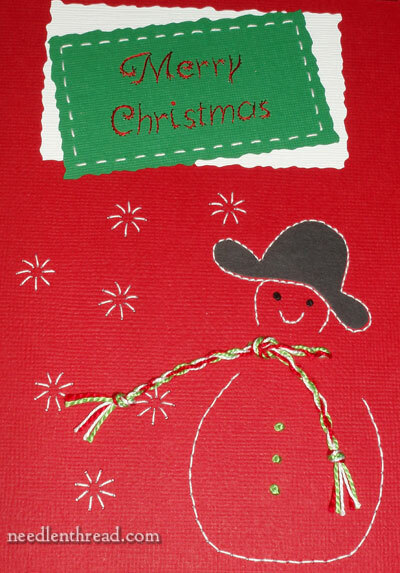 Embroidery on paper is a great way to make cards that are unique, fun, and more like a gift than a card. Using needle and thread, cardstock and scrapbook paper, Christmas wrapping paper, and a little bit of “bling” from scrapbooking stores, I was able to personalize several dozen Christmas cards that year. Yes, it was a little time consuming, but it was Fun! I’d stay up late, late, late working on “one more card” – addicting stuff, you know! 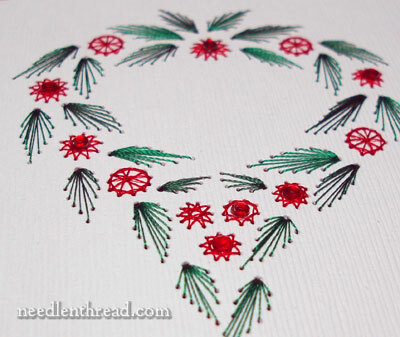 I think my favorite sources of designs for embroidery on paper, and specifically for Christmas cards, are Erica Fortgens’s books, especially Merry Christmas Embroidery on Paper and Basics of Embroidery on Paper. The former is full of beautiful Christmas-related designs for paper embroidery, and the latter has all kinds of designs in it, including some Christmas and many geometric designs and repeatable patterns that can be adapted for Christmas use. Some cards can pretty simple, while others can be more ornate. It’s also easy to make different “exchangeable” elements all at one time – like the “Merry Christmas” tag at the top of this card. You can do the paper piercing for several tags all at once, to save time, and then tote around only the little tags to work on until they’re all complete. “Bling” is always a welcome addition on embroidered cards. On this wreath, a few carefully placed red “gems” gave the wreath a more lively look. These little “gems” can be found in the scrapbooking section of hobby stores – they’re flat and sticky on one side, pre-glued so you don’t even have to mess with dabbing glue on your card surface. 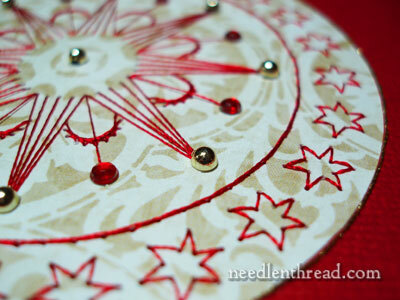 Metallic threads work well on embroidered cards, too. Thread-wise, I find that machine embroidery threads are the way to go. They hold up well to abrasion while passing in and out of the paper, they have a great rayon-induced sheen, which works well on cards, there are plenty of metallic options, and a spool of machine thread lasts and lasts and lasts, making it a bit more economical than embroidery floss and the like. 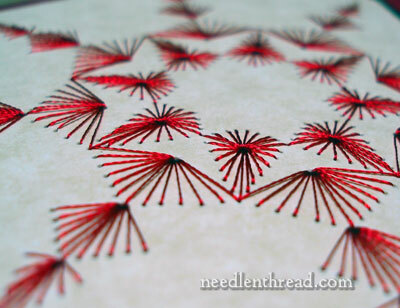 I’m using the same machine embroidery threads I was using five years ago, that I bought on sale (you can often find them at 40 – 50% off) at a sewing store. You can definitely use floss, though, if you want! You’ll get better coverage with one strand, but delicate intersections are more difficult to work, as the floss really builds up in those little holes. With the machine stuff, you can also double up your threads for thicker coverage. I wouldn’t personally use silk or the like on cards – it’s too expensive, for something that may not be kept by the recipient! So, if you’re looking for a way to personalize your Christmas greetings this year, you might consider embroidering a few Christmas cards! Sure, you might not be able to stitch them for everyone on your list, but working up just a few for special friends or family would be fun! I find this kind of stitching therapeutic – it’s relaxing, it’s creative, it’s “no pressure” stitching. 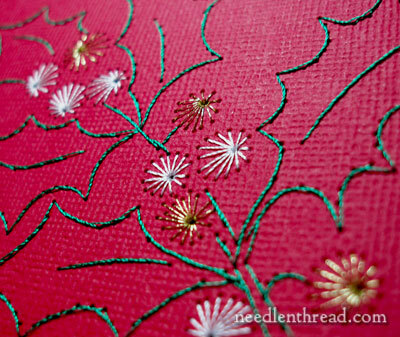 You can find more information on embroidery on paper right here on Needle ‘n Thread. 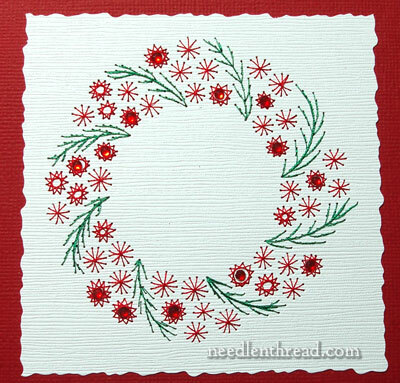 You can even design your own cards, or you can find free patterns for embroidered cards online, like this little holly wreath pattern. In addition to free patterns, there are plenty of places online that sell single downloadable patterns inexpensively, like A Stitcher’s Dream on Etsy, where you’ll find, for example, this pretty poinsettia pattern, or this really cute little Santa Clause, or this swirly, swashy Christmas tree. While those are absolutely lovely, and I would love to get one, the thought of embroidering over 150 cards makes my fingers ache. I should have started two years ago! Oh lovely cards! I don’t send out that many cards, but even so, unless I had some extra energy, I’d do these for only a few who are really close (parents) or might need a special treat than comercial cards. Love ’em!! Something I might be able to get my 13-year old granddaughter to do with me. She loves gluing rhinestones on things! Thanks so much for this post I will certainly look up the links you have provided on your post. 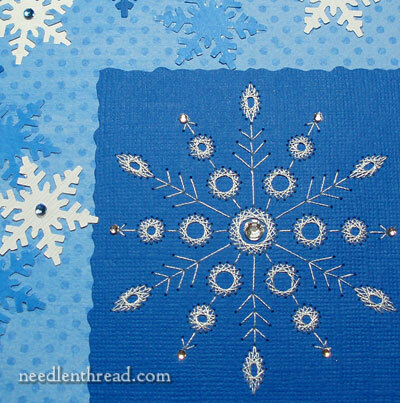 You could even use the star you showed us the other day and applique it to a card. what a lovely idea. I will certainly think about embroided Christmas cards. This is wonderful. I’ve been interested in making cards for years. I found a couple of free patterns but have been hesitant to try them. It’s nice to know there are actual books out there with instructions and how-to’s. That is so neet. Thanks for the links, too. It looks like the perfect melding of embroidery and scrapbooking. I’m embroidering mine this year, too, but not on paper. I found this panel fabric at the quilt shop that is vintage Christmas cards. I’m going to embellish them with embroidery and beads, etc. and then make them into cards. Next year I think I might just try them on paper. It looks like such a fun project. Hi Mary! I love stitching on cards. A couple of questions. I usually secure the end of the thread on the back of the card with masking tape. How do you secure your threads? Also, I use double stick tape to adhere a blank card over the stitching so the recipient doesn’t see the back of the stitching. Do you do the same? WOW! What a spectacular treat it would be to receive a card from you! Love your embroidered cards Mary! I’m sending some myself this year. The cardstock supplier suggested creating a tri-fold card, then cut the stock to order for me. Cardstock is 80#. To secure tails, I used Elmers Craft Bond Glue Stick, acid free. To create the “boot”, I used Wonder Under to fuse holiday fabric, then looped Glissen Gloss Estaz thru backstitch to make the cuff. If my upload worked, there should be a photo of a few in the Ask & Share section. Previous Previous post: Inspirations Magazine for e-Readers!